The Sabah Art Gallery was founded in 1984. It is placed under the Ministry of Tourism, Culture and Environment Sabah under the administration of the Sabah Cultural Board. The objectives of the Gallery are to collect, store, preserve, interpret and exhibit both local and foreign works of art. And to date, the gallery has acquires over 3,000 pieces of artwork in its permanent collection in the form of paintings, carvings, sculptures, installations and so on, mostly by local artists. For more than two decades the gallery shared facilities with the State Museum and held exhibitions at various venues in and around Kota Kinabalu. This year Sabah Art Gallery finally has a home. 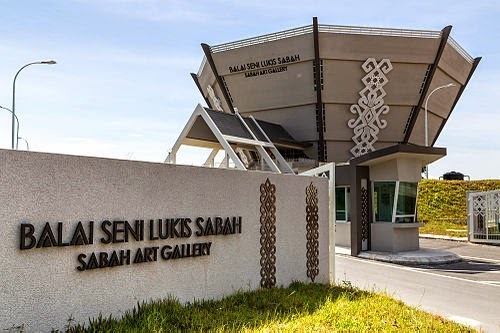 In August 2012, the dream was finally realized with the completion of the permanent Sabah Art Gallery Conservation Centre (Pusat Konservasi Balai Seni Lukis Sabah) which is located on a 1.7-hectare land on Mile 2, Jalan Penampang. The building was a dream come true for the ex Director, the late Datuk Mohd. Yaman Hj. Ahmad Mus, who was also the founder of the Sabah Art Gallery. The octagonal building plan was inspired by Datuk Yaman’s deep interest in geometric shapes in general as evident in many of his artworks. The geometry also makes for a more user friendly centralized circulation pattern as requested by Datuk Yaman himself. Even more striking than the building’s plan is its form with the walls that taper outward from the base at an angle of 30 degrees giving the Gallery a most distinctive appearance. The construction of this building was one of the most exciting and unique challenge for the builders. The Gallery’s structure and walls are made entirely of reinforced concrete. Of the buildings four levels, the first two are reserved for the Gallery’s main occupation which is conservation and preservation of the State’s asset – the art collection. The upper levels (level 3 and 4) are reserved for exhibition space, office and library. Entry is at the second level and the main vertical circulation is via lift and central staircase. The light coming from the skylight above the central staircase is one of the most attractive features of the interior space. Sabahan traditional motifs are seen throughout the Gallery in particular the subtle floor patterns at the entrance area and four decorative panels on the external wall which encompass the common motifs used by many ethnic groups such as the Murut, Irranun, Bajau, Lotud and Rungus. The Sabah Art Gallery Conservation Centre was awarded Silver classification from the Green Building Index Assessment Panel in 2012. 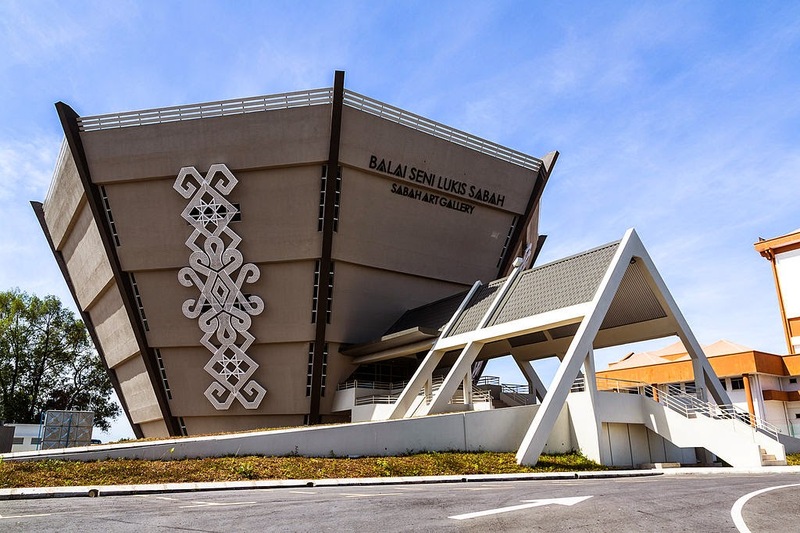 It is the first officially recognized Green building in Sabah and the first Green public gallery in Malaysia, complete with solar panels, passive design, rain water harvesting system and movement sensor lights. 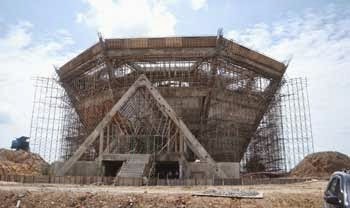 This unique and special building will hopefully give more prominence to the role of art in Sabah as well as being a talking point and an attraction for art lovers and tourists alike for years to come. The Sabah Art Gallery organizes exhibitions and events promoting works by local and international artists. Art workshops and annual competitions are also conducted to encourage the local talents and to increase the collection of the Gallery. Currently, the Gallery is hosting the Sabah Women Painters Art Exhibition. The exhibition which will be ongoing until 29 September 2014 will consist of the creative works of female artists. This exhibition aims to encourage more women artists to be active in the local art scene as their involvement could lead to the development of a special creative movement and style in the country. For more information, call +60 88 268748 / 268825, fax to +60 88 210040, email art.gallery.sabah@gmail.com or visit www.facebook.com/www.sabahartgallery.com.my. Opening hours are from 9:00am to 5:00pm daily.